Oh, irony. It’s only a very short time since I mocked Nick Fell, marketing director at SABMiller, for sharing with us, in a presentation about getting more women to drink beer, the “duh, really?” statement that “no one wants a pink beer, including ladies.” But now I have discovered a beer I’m sure very many women will like – and it’s pink. Not that they’ll like it because of its colour, of course: they’ll like it because it’s a very fine beer, with great depth and complexity of flavour, a beautiful deep bassoon-like bitterness (in contrast to the violins-and-saxophones bitterness of hoppier beers) giving structure to a sweetness that is laced through with liquorish and dark green herbal flavours. How do I know women will like it? Because when I sampled a bottle myself, right after thinking: “This is an extraordinarily good beer”, my next thought was: “I bet Mrs Z would enjoy it” – and not only did she enjoy it greatly, she relieved me of the rest of the bottle, consuming it all herself. Mrs Z is rarely a beer-drinker, touching only the very occasional pils and the even more occasional wheat brew. So if she loves a beer that I think is great too, you can bet we have a genuine cross-party vote-winner. What is this beer? 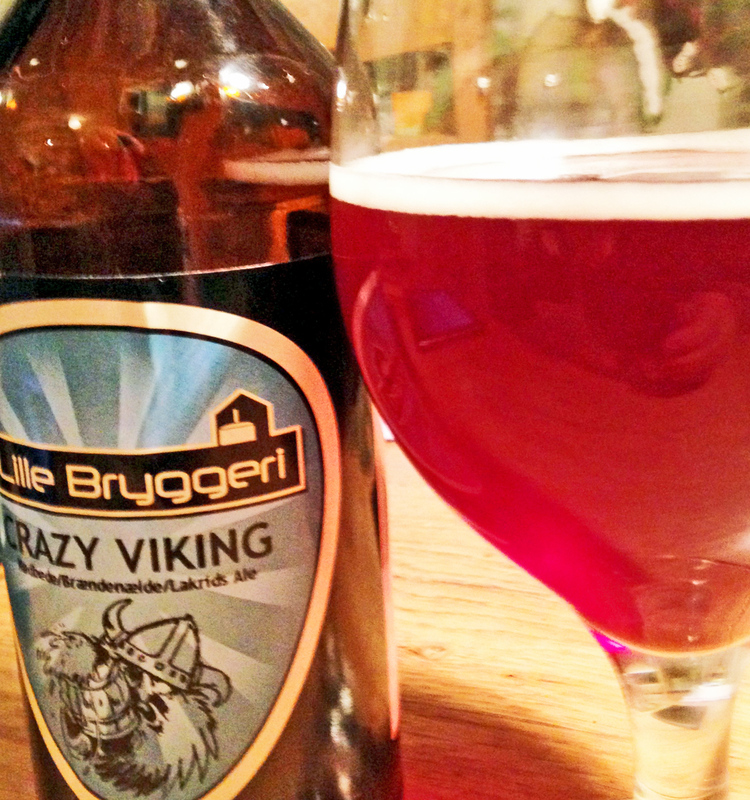 It’s Crazy Viking, one of the brews I brought back from my trip to Denmark last month to talk at the conference on Ny Nordisk Øl, or “New Nordic Beer”, it’s made by Det Lille Bryggeri or Little Brewery, from the small village of Bringstrup, just outside Ringsted, in the middle of the Danish island of Zealand (the one Copenhagen sits on), and it’s a deep ruddy pink because it contains considerable quantities of beetroot (red beet, to Americans) and beetroot extract, added both into the wort before boiling and in the fermentation tank. It also has in it masses of liquorice and nettles, those two giving most of the bitterness, I’m guessing, and only an “extremely limited” amount of hops. Beetroot is about seven per cent sugar, of course, and doubtless that helps to lift the abv of the beer up to 7.9%. I’m not sure the Crazy Viking beer name would recommend itself to women drinkers, and nor, probably, would the beer’s bottle label, with its image of an utterly sloshed Viking, one helmet horn drooping. But the liquid itself is an example of what a number of people have suggested since Nick Fell raised the spectre of the missing female beer drinker again back in October: that if there is going to be a style of beer that will appeal to a broader spectrum of women than drink beer now, it certainly won’t be one made by a giant corporation setting out deliberately to capture that market, and it’s much more likely to be the result of an accidental spin-off from a craft brewer or group of craft brewers, like the Ny Nordisk Øl crowd, making a beer that everybody agrees is great, regardless of gender. Which gives me an excuse to rerun on this blog the dreadful history of the efforts brewers in the UK have made – unsuccessfully – to target women drinkers for three decades, sometimes with, yes, pink beer. For the history of beer marketing is littered with the smoking wrecks of attempts to get females to drink more beer, dating back to the 1980s.